Drag the progress bar to the 1:02:45 mark to view their seven minute presentation. The presentation includes several interesting photos from the book. JIKA ANDA SUDAH CAPE DAN LELAH DENGAN STATUS P7-PERGI PAGI PULANG PETANG PENGHASILAN CUMA PAS-PASAN DAN TIDAK TAU HARUS BAGAIMANA LAGI UNTUK MENINGKATKAN KONDISI FINANSIAL KEUANGAN ANDA…MAKA SAYA MINTA SEGERA HUB NYAI-RONGGENG DI 082-189-481-547 ATAU KLIK http://pesugihanuanggaibsakti.blogspot.co.id/ BELIAU PASTI MEMBANTU ANDA SAMPAI ANDA SUKSES,SPERTI SAYA.KEHIDUPAN SAYA YANG DULUNYA SUSAH SEKARANG SUDAH SERBA BERKECUKUPAN BERKAT BANTUAN DARI NYAI RONGGENG.ANDA PASTI SUKSES JIKA UDAH DI BANTU AMA NYAI RONGGENG SEGERA SAJA HUB BELIAU JIKA ANDA UDAH CAPE HIDUP SUSAH. "The telling of history is most compelling when it focuses not on the great sweep of peoples and nations, but on the intimate lives of ordinary individuals carried along by momentous events. Phil Scearce's Finish Forty and Home is a triumph of intimate history, following the author's seventeen-year-old airman father as he goes to war in a forgotten but fiercely contested corner of World War II. 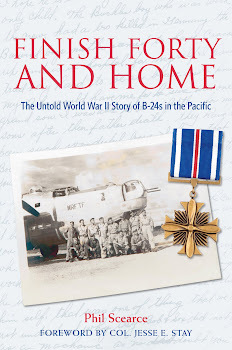 Through meticulous research and lyrical prose, Scearce captures the grim grind of the Pacific war, life and death in a battered bomb squadron, and the tumultuous experiences of a B-24 radioman and his crew. Finish Forty and Home is a treasure: poignant, thrilling and illuminating." We fought a small war in the Central Pacific. Our numbers were not large but the percentage of men and planes lost was great. When I arrived in Hawaii in October of 1942, I was billeted in a barracks with the officers of four combat crews, sixteen of us in all. When I left the Pacific for home in March of 1945, there were four of us still alive and two of the four, Russell Phillips and Louis Zamperini, had spent two years in a Japanese prison camp. 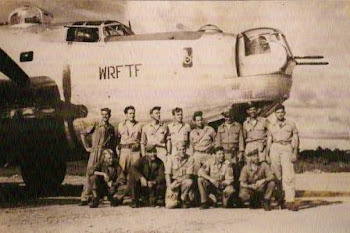 In a five-week period flying bombing missions over the Marshall and Gilbert Islands, we lost four crews and five airplanes out of eleven in the 42nd Squadron. I finished my forty missions in January, 1945. I was released as Squadron Commander and returned home on March 10, 1945, twenty-nine months after leaving. This history brings back memories of the dear friends who gave their lives in this war and is a tribute to them and to all those, like Sergeant Herman Scearce, who laid their lives on the line and were blessed to survive. It is a comfort to know that this record has been written in remembrance of these patriots and of this part of our war in the Pacific. Phil Scearce is the son of Sgt. Herman Scearce, a World War II Pacific War veteran. Phil grew up listening to stories about his dad's experiences during the war, and it became apparent to him that this was a story that hasn't been told--the impact of bomber operations in the Pacific war theater and the lives of Army Air Corps crews. Phil is a 2009 graduate of the Middle Tennessee State University Writer's Loft Program and a member of the Tennessee Writer's Alliance. His work won third place in The Write Helper 2009 Dead of Winter contest and a short story adapted from Finish Forty & Home was a top 15 finalist in the 2008 Prescott College Alligator Juniper short story contest. He is a graduate of the University of North Carolina at Chapel Hill, North Carolina and has numerous professional designations. When not writing, Phil works in insurance and enjoys spending time with his wife, two children, and five cats. Finish Forty and Home is the compelling but little known story of America's bomber offensive in World War II. Sometime after midnight, the air raid signal sounded. A shrill, piercing siren, ten second blasts at five second intervals, caused the men to stir. Marines ran from tent to tent, yelling “Air raid! Air raid!” Scearce and his heavy-eyed crew mates half-heartedly swung their legs to the ground, assuming this was someone’s idea of a joke, or maybe a drill. There was a shallow hole near the crew’s tent, and Scearce piled in on top of his crew mates. Falling bombs made menacing whistling sounds while explosions threw orange flashes about tree tops and tents, casting silhouettes of men running. The smell was pungent, like sulfur, or a spent shotgun shell. Forty terrified villagers huddled inside the Missionary Church, praying that its concrete walls would save them. Marine Corps Corporal Fonnie Black Ladd ran into the church, calling for the people to get out, imploring them to get away from the church, to take cover elsewhere. He knew that the church was an obvious target for the Japanese. A salvo of bombs stepped toward the hole containing the men of Dogpatch Express, its pattern of explosions growing louder and closer and coming straight. Scearce held the sides of his helmet with both clenched fists, trying desperately to fit under it. Knees to his chest, teeth gritted and eyes squeezed tight, Scearce knew the next one whistling toward them would be very close. With a terrific whang! the bomb hit the ordnance truck parked just a few feet away. Dirt and metal rained down. In the next second, a hissing cylinder landed in the men’s tiny hole, right on top of Elmer Johnson. For a moment, the men of Dogpatch Express could hear nothing, then the sensation of sound returned with a high-pitched ringing, and the powerful stench of explosives filled their nostrils. Scearce’s mind raced. “This is it,” he thought. The metal cylinder continued to hiss, but the men didn’t move, afraid they could cause it to explode. Johnson was afraid to even breathe. While the hissing weakened, the whistling of falling bombs and their terrific explosions finally stopped. Voices were audible now, agonized screams, cries for help, shouts, people giving orders. The enemy aircraft could be heard again, leaving the island toward the north, toward Tarawa. There was crackling and popping and strange metallic groans; planes were burning. In the dim light of early morning, with gray-black smoke stinging their eyes, the enlisted men of Dogpatch Express accounted for each other. All blog materials are copyrighted by the author, Phil Scearce, and may not be used without his permission. Mr. Scearce welcomes inquiries. Contact him through pscearce@comcast.net.